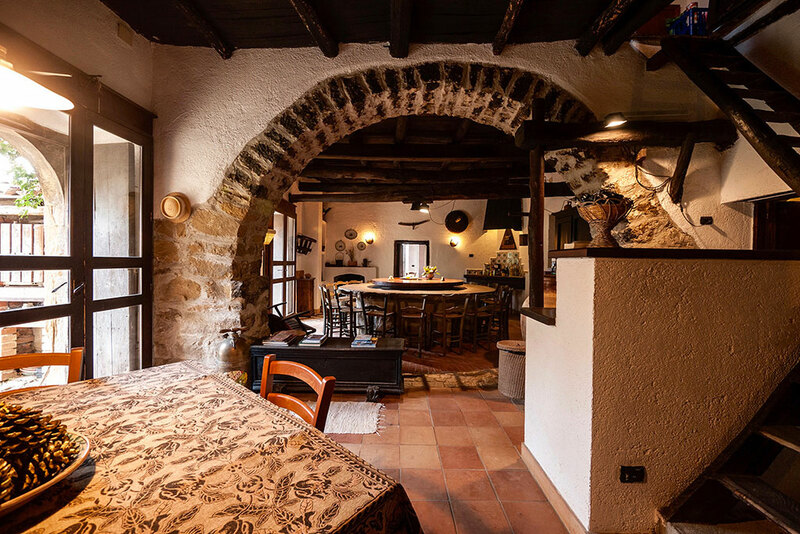 Casa Migliaca is a stone-walled building with the quality of these old constructions, here the scars of time, rather than spoiling its original beauty, have added to the old building only charm and dignity. 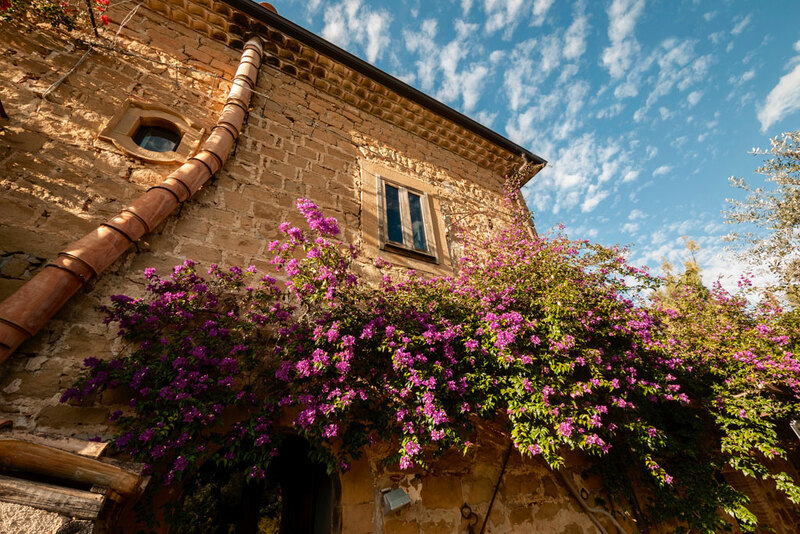 It has always belonged to the Allegra family and without any ownership changes and notaries acts, it is difficult to state when the house was first built, but surely before the XVII century. The stone oil-mill keeps a record of the date of MDCLI (1651) which might be the date of the first restructuring into an oil mill (rural buildings of this sort, very common in the italian landscape, are called “palmenti”). This first part coincides more or less with today’s basement, excluding the rooms on the west side clearly added later. The east wing, that includes the farmers lodging and the stable, was added around the same period. 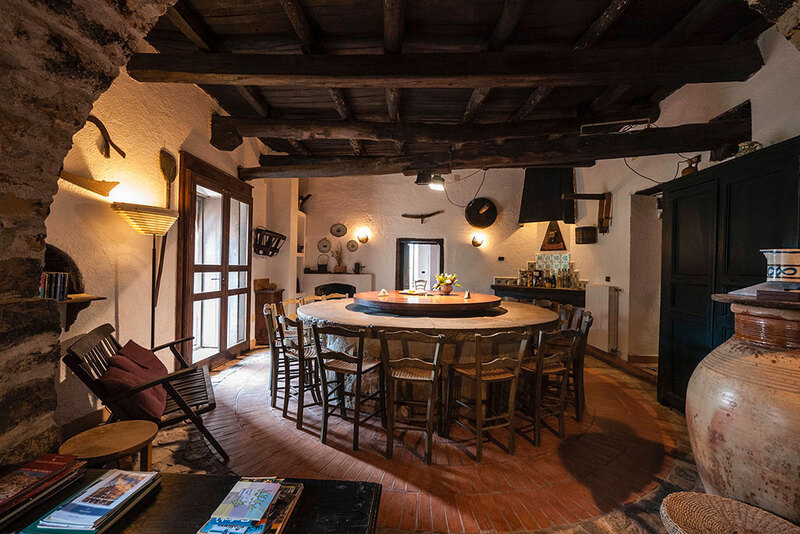 Only in XIX century the rooms on the west side of the upper floor were costructed and the roof was rebuilt with today-four pitches- layout. The old rural building (changed in oil mill) became a country mansion for the owner. At the beginning of the ninety, the building was adapted to the latest use as farm-hotel, adding a minimum of comforts. 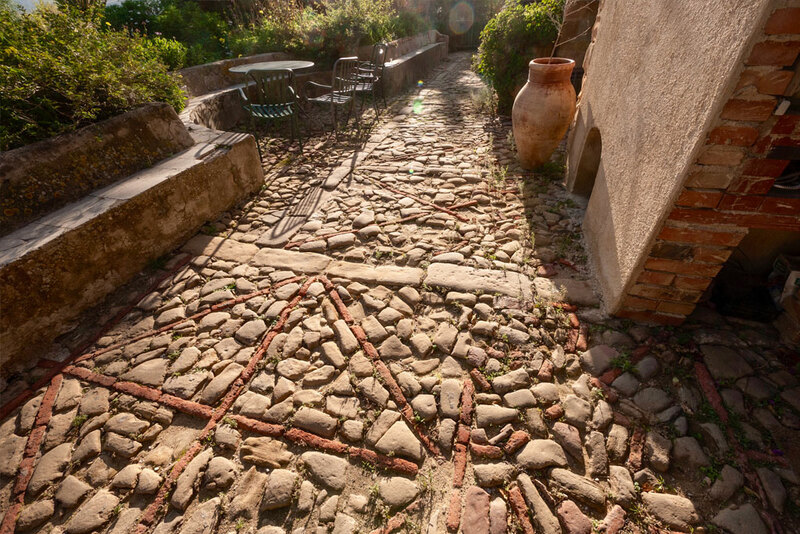 However, the highest attention was paid to all details in order to preserve the atmosphere of the ancient farm; a careful restoring imposed some dimensional limits especially when bathrooms were added to each room. 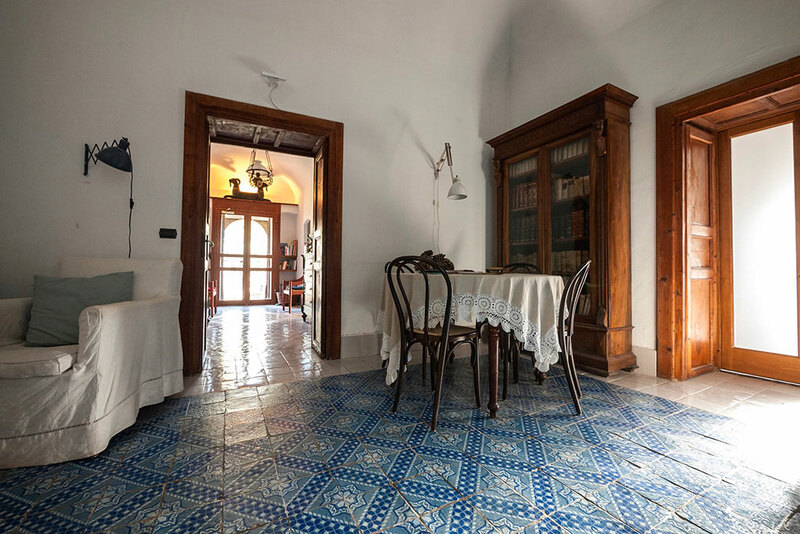 The rooms maintain their original volumes and the memory and even the names of their original functions. 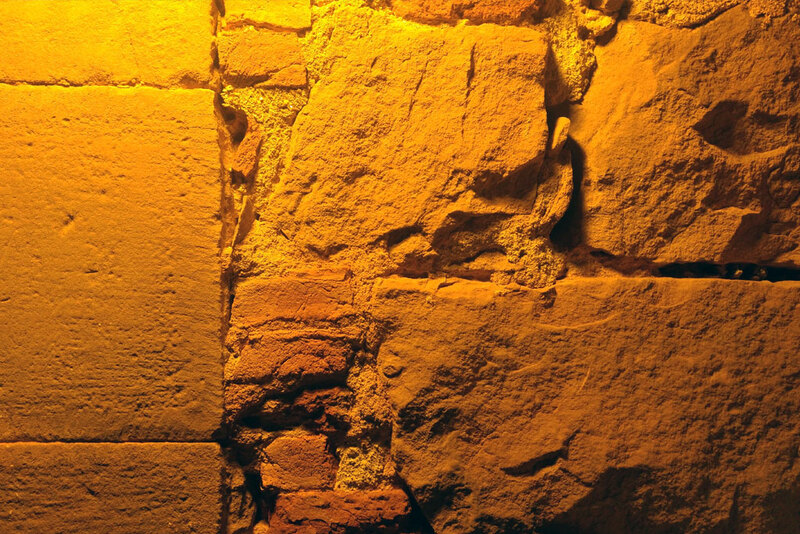 The main machines as the oil mill, olive paste press, underground oil reservoirs, are still in their original place. Even the original clay jars are still sparse in the gardens, now converted into flower containers. 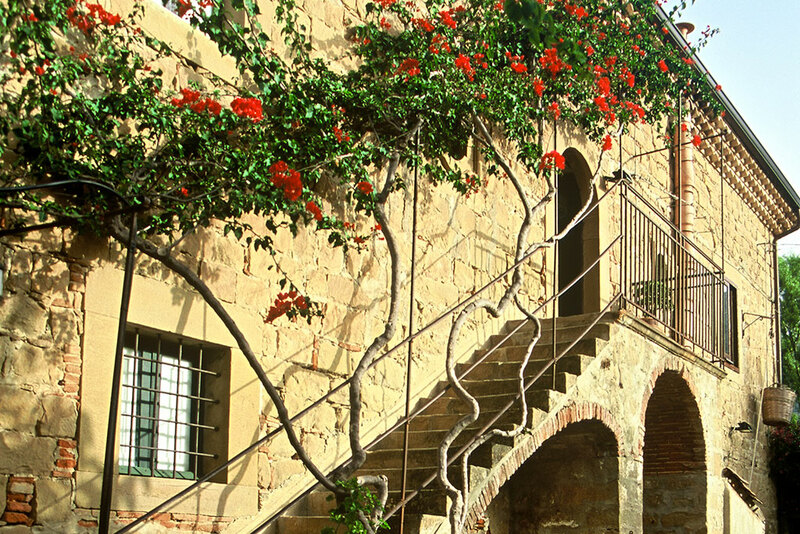 Casa Migliaca consists of the ground floor and the first floor. The ground floor is the original nucleus of the house and includes the large “Oil Mill lounge” plus five sleeping rooms; four of these have an external entrance. 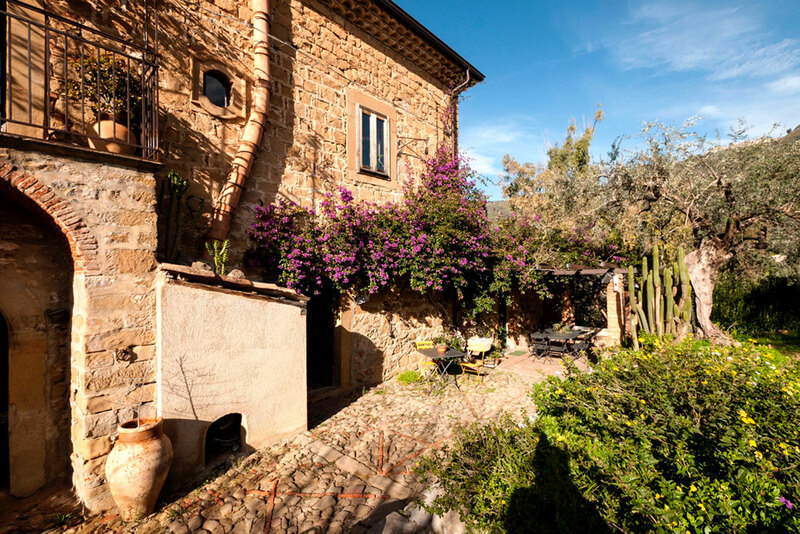 The first floor is accessed via an elegant external stoned-built staircase with iron wrought banister and a shady buganvillea; here you find the all important kitchen, the living room and three bedrooms. 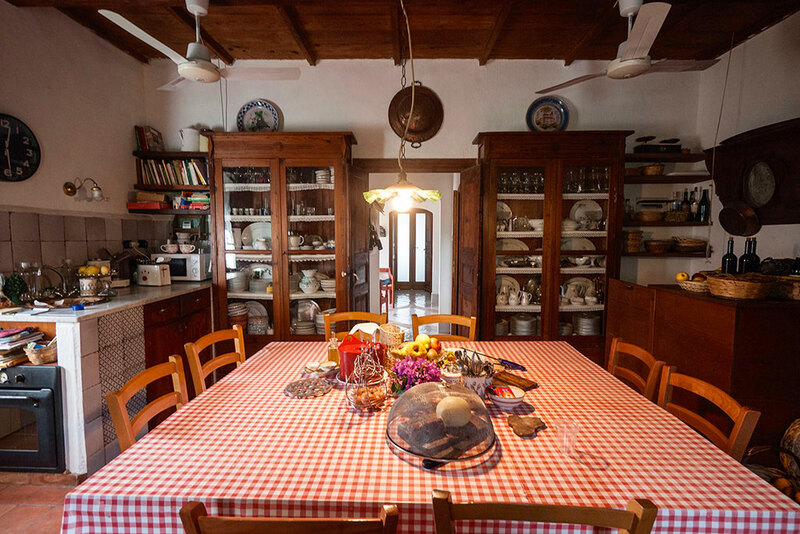 On the right side of the entrance on the first floor there is the kitchen, a charming miscellaneous of ancient and new. Are old: the enormous oven, always on during winter to warm the whole room and occasionally to prepare foods; the two glass-fronted cupboards with antique dishes and glasses, the wooden gallery overlooking the kitchen itself, the roof, the fired tiles on the floor and the wooden stair to the oil mill lounge. 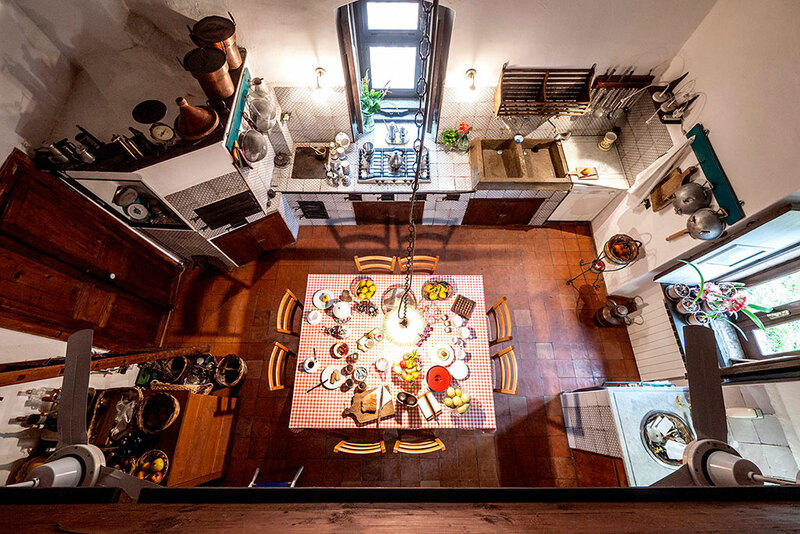 Are new: the gas cooking device that replace the old ones working with coal, the big square table where the guests, together, prepare themselves the generous breakfast in the morning and the stainless steel basin unused because of the much more alluring old one made of stone and concrete. To enter on the first floor gives the feeling to be in a place where time has stopped. 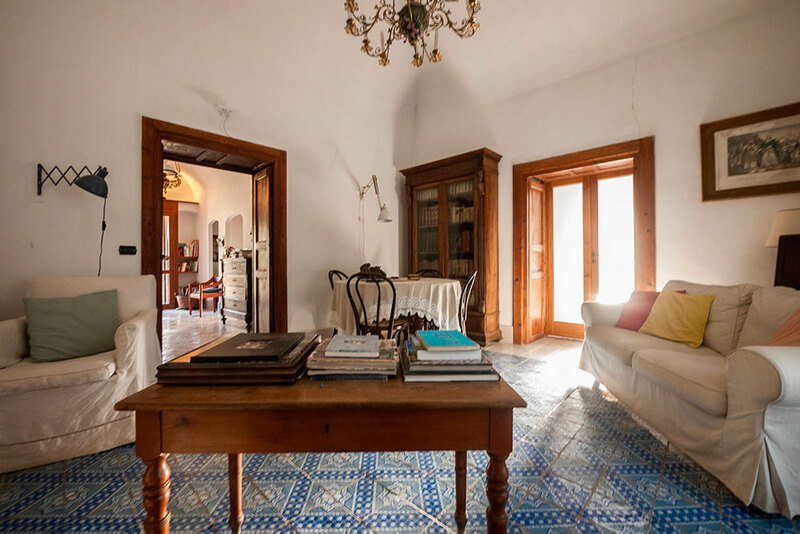 A number of airy plastered-cane vaulted ceiling (falsi dammusi) correspond to their access rooms leading to the kitchen, the yellow and the living room. Two openings –right and left- lead to small spaces once the bathrooms of the house. 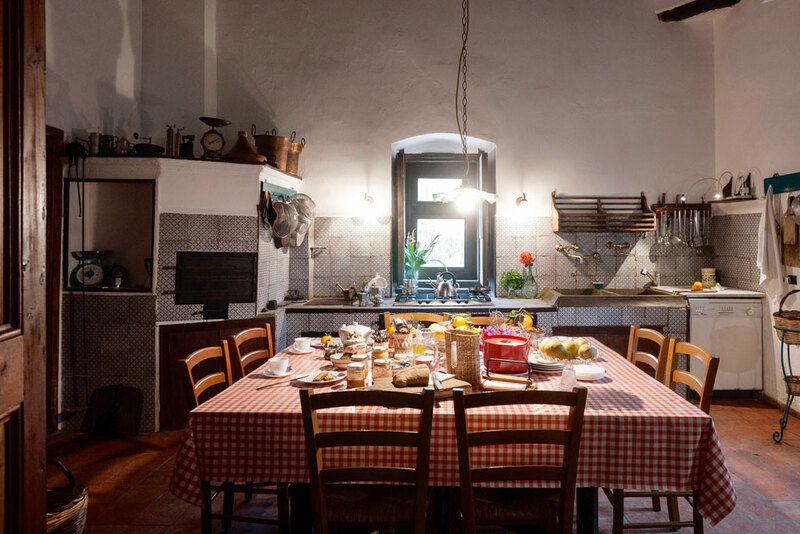 This – in a XIX century country house- gives an idea of the hygienist attitude of the family ancestors. 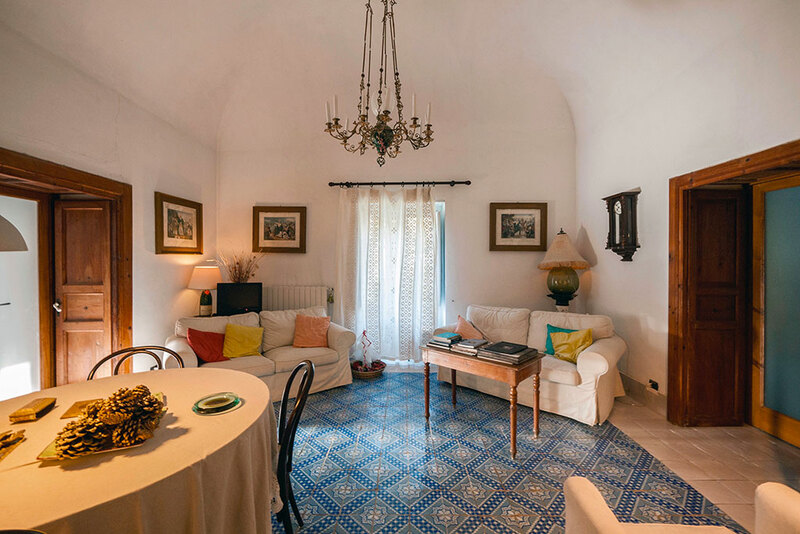 The common living room is bright with Santo Stefano di Camastra soft-colored old floor tilings, original plastered vault and walls and the balcony veiled with linen hand made curtains. 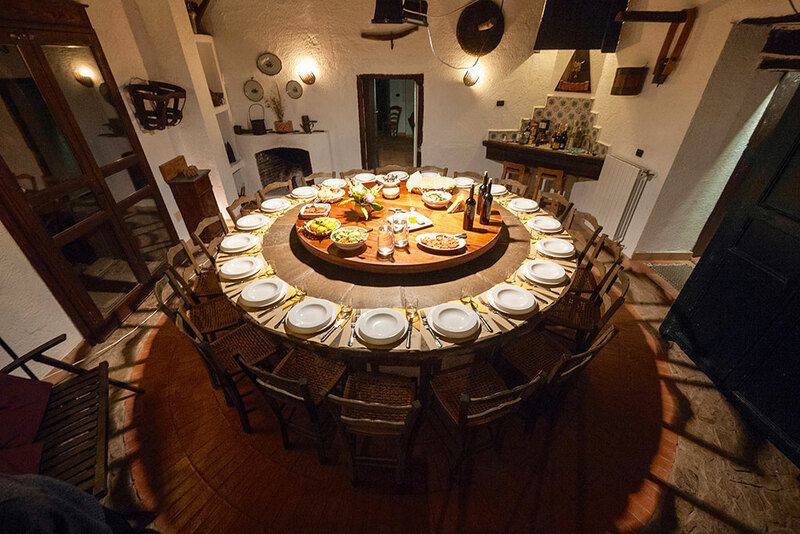 The Oil Mill Lounge, original nucleus of the house, is a wide living space arranged around the unique stone round table – capable twenty persons with matching wooden lazy Susan working on the original bearing – obtained from re-arranging the old stone oil mill. Above the table, which bears the date 1651, you can see a hinged wooden beam which could be lifted to allow the periodical “roughening” of the surface of the millstone to ensure maximum grinding efficiency. The lounge includes remnants of the old olive paste press and a view over the “new” oil reservoir under the floor with a glass-protected illuminated overview, the manger for the animal in charge to drag the mill and the fireplace to heat the water needed to enhance the oil extraction under the press. All the tools here are still witness of the rite of oil extraction, today substituted by the dinner rite. Toward north and south open spaces shaded by centennial trees: To South olive trees and a big Whashingtonia Philiphera and Tamarix, to North Pines and Lebanon Cedars with a great Phoenix in the center. Often, during summer, the south area is used to take dinner. It’s pleasant lo linger in front of the last glass of wine to tell the story of his own travel day or delay on long conversation or just listen the surrounding nature, the flight of night birds or the fox lure staring at the constellations. During hot sicilian afternoons it’s nice to relax in the northern area thanks to the cool breezes blowing from the sea, and looking at the bleu of the Thyrrenian sea towards the Aeolian islands or the red sunsets on the sea. 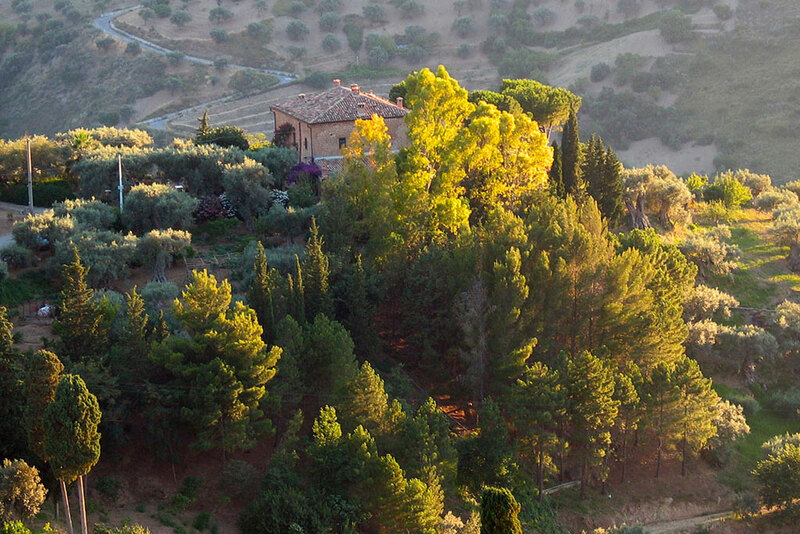 To west a veil of Bleu Jacaranda flowers in June and Cypress and Eucaliptus to east complete a green circle around Casa Migliaca.